Beverly leaves a letter for Jim saying she's gone away for a few days, "to think". Paul hasn't got time to try to build bridges with Morecombe Industries - he's got another deal going with an American chain, and he wants to meet Paul in Buenos Aires to discuss it. Caroline isn't sure that would be enough to make up to the lost of Morecombe Industries. She says she'll have a go at getting them back on side. Kerry didn't know that Beverly was going away, so she can't give Jim any clues to her whereabouts. She says Beverly seemed a bit withdraw last time she saw her, but that's only to be expected after what she went through. Just then, a random woman in old clothes carrying a big rucksack appears, and Kerry recognises her as her friend Amber. They hug - Amber has managed to track Kerry down through Harold's forwarding address. Apparently they've known each other since they were kids and travelled overseas together. Amber tells Kerry she missed out on a lot when she got pregnant with Sky and came back to Australia, but Kerry says that Sky is beautiful, and what's more, she's pregnant again! Kerry introduces Joe and Amber is really surprised to hear that Joe and Kerry are married. She doesn't believe that Kerry would ever tie herself down, but Kerry explains that it really is true. Melanie warns Christina that Paul is in a bad mood(!) She is in a good mood though and joyfully tells him that the gift shop profits are up by 25%. Paul is very distracted and unappreciative and Christina is not impressed. She stomps off. Amber and Kerry are talking animatedly about animal rights and stuff. Kerry says that she's still involved in environmental issues, but she has to tone it down with two kids to look after. Joe is rather uncomfortable and gets up to go, but Kerry asks him to stay. She tells Amber about her local triumphs, like the campaign against the gift shop fur stocks and releasing the mice last week. Joe says Kerry is now risking arrest for trespass but Amber says that they must stand up for their beliefs! 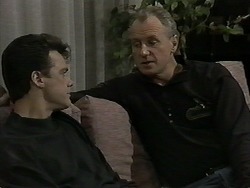 Amber tells Joe that Kerry always thought marriage was the ultimate cop-out. Kerry says she was naive back then, and Joe agrees - he thinks Amber will want to settle down one day. JOE: You tell Amber what she's missing out on, Kez! But Kerry is looking distant and uncertain. JOE: You're happy now you've got the kids and me, aren't you? KERRY: I'm here, aren't I? But her face says that part of her misses her old life and campaigning ways. Gemma and Matt are having a chat about their social situation (or lack of). 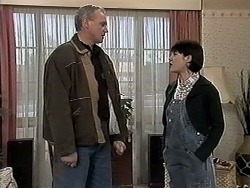 Gemma asks if she and Matt can go and see a film tonight while Madge is out at work. 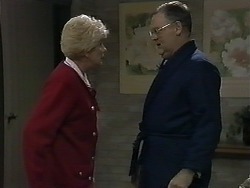 Harold knows nothing of the earlier row with Madge and agrees. 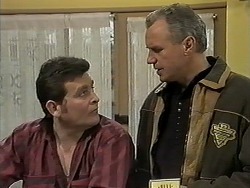 Jim comes in and asks Des if he's seen Beverly. He explains she's taken off, and he doesn't like her being on her own after what she's been through. Des has brought a few beers around. Amber says she's cooking dinner tonight to earn her keep. Kerry explains that Amber is staying for a few days. Joe doesn't look very pleased to hear this, but he doesn't say so. They introduce Des and Amber is even more surprised that Kerry is hanging out with such "conventional" people. Paul is on the phone arranging his Buenos Aires meeting. Apparently Caroline has got Morecombe back on side, and Lassiter's has won the contract after all. Paul is very pleased and gets the champagne out. He says he wants to think of a little reward for Caroline for her brilliance. Matt and Gemma are hanging out in Matt's car, listening to music and cuddling each other. 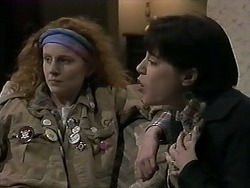 They chat about Madge, and Gemma thinks Madge is hard because Charlene gave her so much hassle in her time. Matt protests that they haven't done anything wrong, so Madge shouldn't punish them in advance! Matt wishes there was a way to get Madge off their backs. They start pashing. Matt says it's nearly time to go, but Gemma says they have plenty of time before Madge gets home from her shift. Madge has come home early as the pub was quiet. 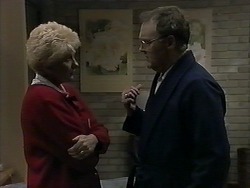 Harold casually tells her that Gemma has gone on a date and Madge is very angry indeed. She explains that she forbade Gemma from going to the movies and accuses Harold of being too soft with Gemma. Harold thinks Madge is being too hard on Gemma, but Madge vows to set Gemma straight over this. Jim is still moping around and is now talking to Paul about Beverly. He was hoping a baby would bring he and Beverly closer together, but it hasn't worked. He heads off, sadly. 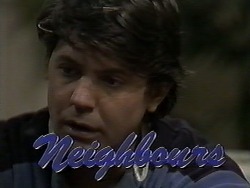 When he's gone, Paul tells Caroline that he thinks Jim and Beverly will work out their problems. Just then, Christina comes in, telling Paul that she's had an idea - she thinks Lassiter's needs a new logo. Paul brushes her off, saying he has a long flight tomorrow, but Christina goes mad, accusing him of never listening to any of her ideas. He is a bit takenaback and agrees to listen to her logo idea. But she stalks off to bed, upset. 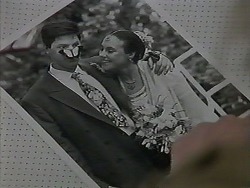 Amber and Kerry are looking through an album of Kerry's wedding photos. They start talking about Amber's environmental activites around the world and Kerry is fascinated. She says sometimes she wishes she could pack up and do the same. But she's committed to Joe and the kids now. Amber can't see this. She asks Kerry if she's truly happy with the way her life's turning out. Kerry says she has everything - a nice home, a husband, two kids and a good relationship with her father. AMBER: Are you trying to convince me? Or yourself? Madge is waiting up for Gemma. She and Harold are getting a bit worried now - it's getting very late. Harold suggests he goes out in the car to have a bit of a look for them. Joe asks Kerry to come to bed, but she wants to talk to him for a minute. She tells him that Amber's just been to an Earth-watch in Borneo - something Kerry has always dreamed of doing. She wants to go with Amber to Northern Australia to work on a project there. Joe is shocked and asks Kerry if she's gone ga-ga - she's five months pregnant, after all! Amber raises her voice and tells Joe that he can't stop Kerry from going. KERRY: Joe, it's my last chance to make some sort of difference to the world. And it's always been something that's very important to me. So please - don't try and stop me. Joe just rolls his eyes.